I get on the train at Carmarthen and it is pretty full with very few spare seats. It will stay like this all the way to Haverfordwest. It leaves Carmarthen at 15.47 and makes a scheduled stop at Whitland, plus two request stops at Clunderwen and Clarbeston Road, all on the mainline to Fishguard. Clarbeston Road station is in a low cutting and has two platforms, both with aluminium shelters. One person is waiting to get on at this request stop station. The train moves away and past a signal box on the right, where the line divides. The mainline to Fishguard goes off to the right, whilst we go to the left, south westwards on a single track line. The landscape starts to become more hilly, with sheep grazing in the fields. The train seems to be descending slightly and we are doing a steady 50 mph on welded rails. After about ten minutes we slow down and houses appear to show we are near Haverfordwest. There are some sidings on the left and we come into the station. About three quarters of the passengers get off here and we wait a good five minutes for the train to clear. There are two red brick station buildings on the two platforms, though for some reason we cross over and come into the up platform 1, where the main station building is situated. Soon after leaving we cross over the River Cleddau and move onto an embankment, passing a factory on the right. We then move into a cutting, as it starts to get hilly again. For some reason after the smooth ride earlier, the train is now very wobbly and shakes a lot. We slow down again as we stop at Johnston, which was once a two platform station, with signs of double track here. The present single platform has a blue painted stone shelter on it. The track now curves to the left as we move into another cutting. Then a single track freight line to Waterston, leaves us on the left. It is a bit rusty and doesn't look like it has been used recently. We now continue on unwelded track and this makes the shaking even worse. A second single track freight line goes off to the right. 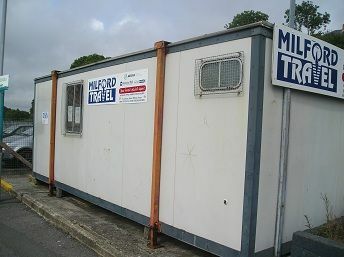 This time you can tell it is used regularly, going to one of Milford Haven's oil refineries. Then we curve sharply to the left and start to slow down, going into a deep cutting, before emerging to the site of rusted sidings on the left and a factory and a Tescos on the right. We then come into Milford Haven station, which is just a single platform without even so much as a shelter. There is a portacabin, which serves as a ticket office, though a sign on the window, says buy your tickets on the train! The train will wait around twenty-five minutes here, before it starts off again on its long journey to Manchester.